New pusher blades for front-end loaders aimed at farmers, ranchers, contractors and more. 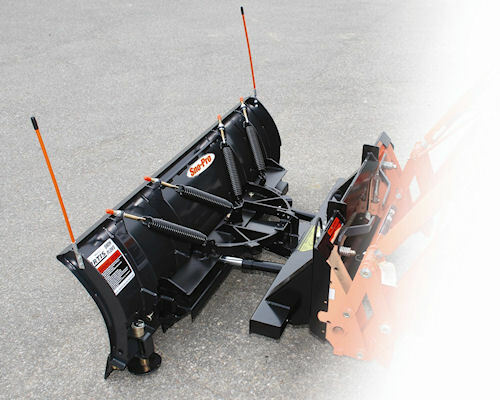 Sno-Pro front-end loader plow blades by Curtis Industries offer a number of advantages over bucket plowing, and work quite well in snow removal, silage and livestock feed handling, and the moving of aggregate materials. Built for pushing, Sno-Pro blades come in handy in snow, aggregate materials, feed and silage. These blades feature 30-degree hydraulic angle for efficient and productive plowing, four heavy duty trip springs for added protection against blade damage, easy-adjust depth shoes, and highly visible guide markers for keeping track of the blade corners. They are made with 11-gauge powder coated steel and feature an extended four-foot push frame for more durability. Blades are available in 5' through 8' models and are recommended for tractors and skid-steers up to 47 horsepower with quick-attach front mounting adapters. For more information on the new blades, call (800) 343-7676, or visit www.curtisindustries.net.